A unique former plantation owner's house with luxury spacious accommodation for up to 8 adults. Extremely private, it is set in the valley of La Brenas with spectacular views of the ocean and mountains. Surrounded by extensive exotic gardens and sun terraces it boasts a large heated private swimming pool. It is in an ideal central location for discovering the most beautiful of the Canary Islands. Untouched by mass tourism La Palma is a walkers' and nature lovers' paradise. The capital Santa Cruz and the beach resort of Los Cancajos are a short drive away. Most parts of the island are less than an hour's drive away. Peter and Janet Baker fell in love with La Palma when visiting friends there. They have thoughtfully and carefully restored an old avocado plantation owner's house which they bought in 2003. They have used experience gained in running two holiday cottages on the coast of Northumberland in the UK to equip Villa Miranda to a high standard. Their aim was to provide modern comforts in a characterful setting. Peter, an amateur artist, was inspired by the flowers and scenery around the house to produce a series of paintings and drawings. These hang alongside other antique and modern works of art on the walls of the house. Peter and Janet were instantly impressed by how La Palma was untouched by the mass tourism which seemed to have taken over some of the other Canary islands. The island has spectacular scenery and many areas are protected from development. Villa Miranda is in a rural location, but with easy access to the capital, the airport and the small seaside resorts on both sides of the island. You feel you are living among a local canarian population and you can share the fiestas and traditions of the area of Brena Alta. Alternatively there is the space to just retreat into the seclusion of the villa and its grounds and enjoy the pool and other amenities. The villa is located fairly central to the island. It forms a perfect base for visiting the national park in the centre of the island, the volcanoes in the south west, the east and west coasts and the rocky regions of the north. The capital, Santa Cruz, and the airport are only twenty minutes away by car. Most other villas for rent on the island are fairly small and basic and do not have a private pool. Peter and Janet set out to provide a level of comfort and luxury in a spacious and traditional setting at a reasonable price. They also deliberately set out to offer a fixed rental price all year round, so that visitors were not doubly penalised by increased villa and flight prices at peak times of the year. Family bathroom on first floor with feature bath, WC and separate shower. En suite bathroom to bedroom 3 with shower and WC. En suite bathroom to bedroom 4 with shower and WC. The villa is in a rural setting down a country . It is set in a large terraced garden and is extremely private. The villa has gas central heating with radiators throughout for the cooler evenings. There is a log burning stove in the dining room which vents warm air into the lounge and balcony room. Logs are provided. 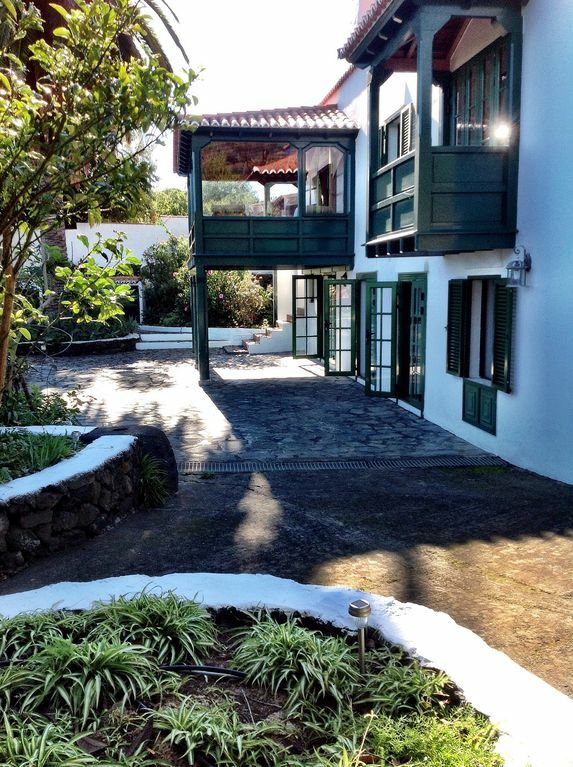 Comfortably furnished, spacious first floor lounge with traditional Canarian peaked wooden roof and original wood flooring. Windows with window seats and French windows to small balcony, all with panoramic views of sea and mountains. Satellite TV and DVD. Extremely large fully equipped kitchen with electric oven, ceramic hob, dishwasher, fridge/freezer and microwave. Dining area with table and seating for 8 under a traditional Canarian peaked wooden roof. Views of terraces and garden. The garden is terraced and contains a range of subtropical flowers, shrubs, trees and fruits. You are invited to sample any of the fruits which are in season. The villa has a number of terraces with plants and trees and some have seating. I was alerted by my housekeeper that this was a large group of young people which I was not expecting and which was beyond the normal capacity for the villa. I normally rent only to families or family groups. Our housekeeper provided extra beds, bedding and towels when she became aware that there were 9 guests. Because of the size and age of the guests she told me she felt it was important that the house was inspected before they left. This isn’t our normal practice but I agreed this was probably wise and explained to the guest that this would be happening. Our pool is a heated pool by an electric heat and is cleaned once per week by a professional pool cleaner. If the guests had concerns about the temperature or state of the pool they were not raised with either myself or our housekeeper. We make every effort to make staying at our villa a pleasurable experience and to respond quickly to any issues raised by guests. It was wonderful! The views, the house the location was great. Easy access to everything with a car. We will definitely stay here again. The house was very comfortable for our family of 5. Loved it!!! Great pool area! But a car is need it to explore the island. Great place to stay! We are delighted you enjoyed your stay. We would welcome you back anytime. This is a nice property, generally well furnished. During our stay, in February, the weather around Santa Cruz was generally overcast and chilly where elsewhere the island basked in sunshine. I understand that this is normal at least for this time of year. We found the house quite cold and it took a few days to get the agent to turn the heating on. Two of the showers were broken when we arrived, although 1 was subsequently fixed. The grate in the wood burner was broken which made its operation difficult. We are pleased that our guests enjoyed their stay. Unfortunately they were unlucky with the weather and it was exceptionally cold. Fortunately the villa does have full central heating. February is the height of the winter in the Canary Islands and all Islands can have periods of cold and rain. Although the East and North of La Palma may get less sun at times, they are the reason the island is known as the ‘isla bonita’ the pretty island of the Canaries. Flowers, plants and trees are in abundance, as can be seen from our terraced garden. This contrasts with the south and west of the island which can be dry and barren with banana plantations growing under plastic sheeting to retain the moisture. Our showers had been damaged and required replacement parts which had to be ordered. Our housekeeper is very experienced and is able to respond as quickly as possible to guest concerns. Very bad security. The owner should not be renting out this villa. Terrible. We were told there was a petty thief in the area and to put everything in the safe provided and keep all doors locked at all times. A thief still got in and pulled the safe off the wall with all our contents passports credit cards driving licences iPads mobiles and at least £2000 in cash. We are very unhappy and will cost a lot of time and money to replace. Unfortunately our guests were the victim of a rare ostentatious burglary,where the thieves were obviously not able to find any valuables in the house and were not able to open the safe and instead prized it off the wall in the linen cupboard where it was hidden and took it away. It is unfair to say that our villa lacks security in that, though it is a quiet rural area with a low crime rate compared with some parts of the Canaries, we have taken steps to protect our guests. The villa has a large solid gate at the end of the drive, bars on the windows at the rear of the villa, locks on all external doors and security cameras. Our housekeeper gave our guests immediate help and support and the local police were involved. The police have suspicions as to who the thieves are. Our guests were advised by me to claim against their travel insurance, if they had any. In view of the loss of their passports I offered them extra days in the villa free of charge if they were unable to make their booked flight. The were also offered an ex-gratia payment for their unhappy experience which they have not accepted. Since this burglary we have increased the number of security cameras, installed a burglar alarm, changed all the locks and will be having a new safe built in to an area of the house. Beautiful villa on a beautiful island! My family enjoyed their holiday at La Palma. The villa was amazing, a beautiful property full of character and the children loved the swimming pool. We loved the short walks to Mount Brena and San Pedro but car hire is vital as the island just begs to be explored. Highlights were the woods at El Pilar, the waterfall at Los Tilos and the sea swimming pools at La Fajana. The stunning veiws from Roque Muchachos and the amazing black sand beach at the characterful capital, Santa Cruz de la Palma. The villa provided an idyllic base with beautiful views of an unspoilt island. Thanks for an amazing holiday! The villa is 15 minutes drive from the beach resort of Los Cancajos. This resort has a number of hotels, restaurants, bars and shops but remains pleasantly small scale. The beach is black sand, as are all beaches on the island, and rocky outcrops make it safe for swimming. La Palma's small airport is a 20 mins drive away as is the harbour of Santa Cruz which has a ferry connection to Tenerife. There are currently direct flights once per week to the island from Gatwick and Manchester. Contact owner for further information. Car hire is essential if you wish to discover the range and beauty of the island. The nearest small town is San Pedro, 5 mins by car, which has supermarkets, bars and shops. Santa Cruz, the capital, is 20 mins drive away. A 45 mins drive through mountain scenery and tunnels will take you to the other side of the island with Los Llanos, the 'second capital' and the beach resorts of Puerto Naos and Tazacorte. It is less than an hour's drive from the house to most parts of the island with its striking contrasts of coast and mountain scenery. Horseriding, diving, mountain biking and walking tours can be arranged in the local area. Though set in a rural area, restaurants, shops, bars and supermarkets are only a short drive away from the house. Booking Notes: Please email or telephone the owner to request bookings. 25% deposit is required on booking. Changeover Day: Changeover days are flexible. Notes on prices: The rental price per week is for a maximum of 6 adults. For more than six adults the following additional charges apply. Addtional Adult £150, Additional child under 12 £100. Children under 2 are free.